Plain raita recipe – one of the simple, plain raita recipe. You can call this tadka raita since tempering is made here and added to the yogurt. I love about this raita is that there is no chopping required. This is the QUICKEST raita recipe I have ever made. 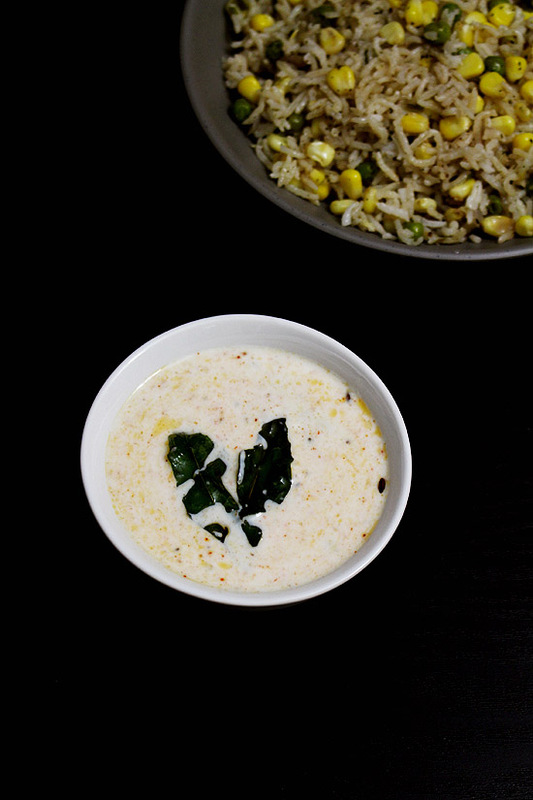 Last weekend I have made this tadka raita and served with corn pulao. I do make thepla or stuffed paratha or pulao very often as a dinner. To go with it, I made different raita every time so we do not get bored. But on some busy days or whenever I feel lazy, I always make this plain raita. It is much better and tastier than serving the plain yogurt. 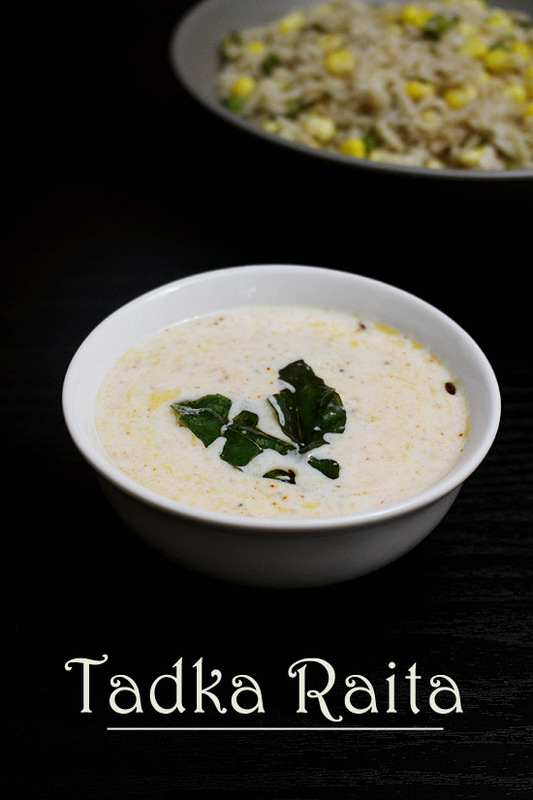 This one and onion tomato raita is one of my go to and favorite raita recipes. 1) Take yogurt in a bowl. Beat it till it is smooth. Now add salt, black salt and roasted cumin powder. 3) Add red chili powder in the center. DO NOT MIX, keep it as such. We will be adding tempering on top. 4) Heat the oil in a small pan. Once hot add cumin seeds and let the sizzle. 5) Then add ginger paste, slit green chili and curry leaves. 6) Saute for 30-40 seconds or till the raw smell of ginger goes away. 7) Now add this tadka on top of the chili powder. 8) Stir it to combine. Serve right away or chill in the fridge for some time and then serve. Serving suggestion: Serve with any pulao like veg pulao, peas pulao, capsicum pulao or veg biryani. It can be served as a side with your meal. Take yogurt in a bowl. Beat it till it is smooth. Now add salt, black salt and roasted cumin powder. Mix well. Add red chili powder in the center. DO NOT MIX, keep it as such. We will be adding tempering on top. Heat the oil in a small pan. Once hot add cumin seeds and let the sizzle. Then add ginger paste, slit green chili and curry leaves. Saute for 30-40 seconds. Now add this tadka on top of the chili powder. Stir it to combine. 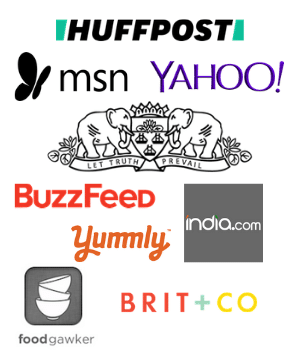 Action in your blog. I think a lot of folks are in the lookout for such ideas for busy weekdays and would help a lot. Might be something you can consider for the blog. Take care!! Thank you Anjana for your suggestion. I will see if I can manage to do meal plan kind of posts. The thing is I usually do not plan for a week. I tried doing this before and sadly I failed. I like to make the recipes as per what I have in my fridge and what suits based on the time that day I have. If I plan ahead of time and that day I might not have much time or energy to cook that planned dish. Also my husband gets unexpected travel for his work and since I am working remotely, I usually go with him. So meal plans never worked for me. If I am not good at it, I am not confident about sharing those.